This is a beginners tutorial that covers the basics of composing and sending an email using the web browser client. How to address an email, including sending to multiple email addresses. 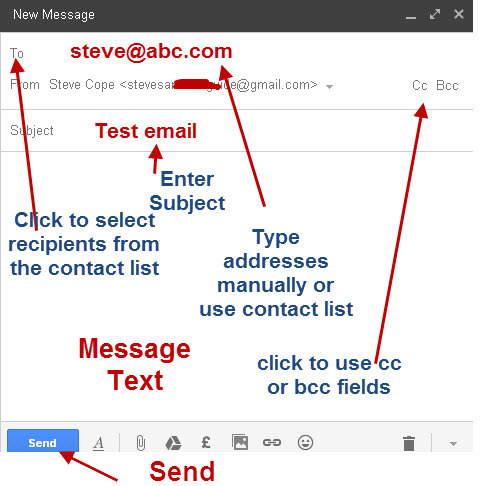 How to send email with an attachment. 1. Login to Gmail. Click the compose button in the top left of the window. You need to enter message recipients, a subject and message text.All messages should have a subject. 3. Click the blue send button send the message. The window closes and you will see a confirmation message above the message view. 4. A copy of all Sent messages are place in the sent items folder by default. have multiple email addresses/accounts associated with a Gmail account. The default email address appears (can be set as part of mail settings). 2. The cc and bcc lines are not shown by default, but you can turn them on by clicking the cc links or Bcc links to the right of the to line (very faint). 3. 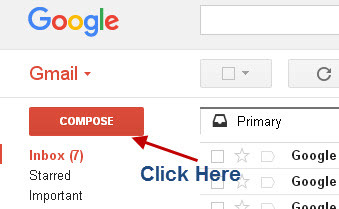 When you type in the email address you will automatically see email suggestions appear. If you are sending to multiple recipients then separate each address with a comma or use a contact list. 4. 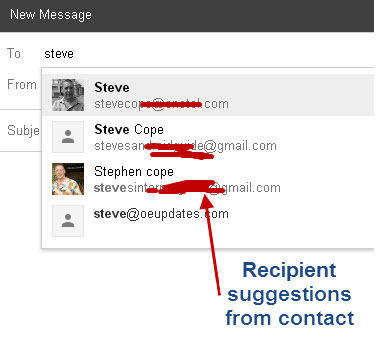 If you want to send to multiple recipients without them knowing then add the recipients to the bcc field. 4. At the bottom of the new message window is a formatting tool bar. This is best seen by going to full screen view by clicking the full screen icon in the top right of the new message window. 5.If you close the message before sending it is automatically saved in the drafts folder. 6. If you don’t want to send the message click the trash icon (bottom right) to discard the message. Messages are created as HTML messages by default, and if you go to full screen view you can see the formatting bar at the bottom of the message. Using the formatting tool bar you can create bullet lists align text,change font size,colour and type etc. Set Full screen as default when composing a new message (preferred). There are two ways of adding attachments. The most common way is to send the attachment with the email message. To do this click on the paper clip icon and locate the attachment on your hard drive. If you use this method then you are subject to attachment size limits (about 25 MB). This method has the advantage that it is easier for the recipient because he doesn’t need to download the attachment to keep a copy. The more modern way, and the method used for sending large files is to use Google drive. If you click the Google drive icon then you can insert an attachment from your Google drive folder. 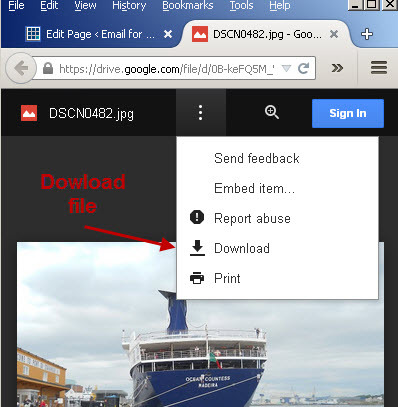 If the file isn’t in the Google drive folder you can upload it to Google drive before sending using the same attachment screen. When sending the attachment there are a number of settings depending on whether or not the recipient is allowed access to files on your drive. If you are sending to untrusted recipients then you send a link to the file. They access the file via the link and can then download it to their PC. Here is an example of the email that they receive. 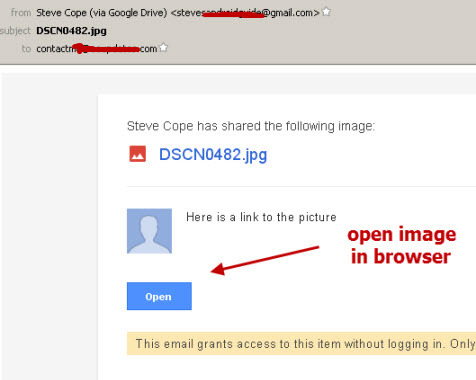 Important; Using Google drive means that the email doesn’t include the attachment, but only a link to the attachment. It is important that they download the file if they want to keep it. 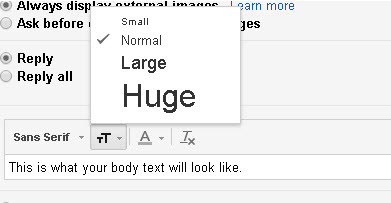 You can change the text size,font and color of sent messages in settings >general>default text style. To add a signature to all emails that you send from Gmail web client then, Go to Settings>general and scroll down to signature. You can have text,links and images in the signature. Although your connection to Gmail is secure, email that you send is not normally encrypted. Google supports enhanced email encryption in transit and will try to encrypt your outgoing email if it can. In order to do this it needs the public key of the recipient,if it has one. However rather than rely on the provider e,g to do the encryption you can do it yourself. This is very useful if you just need to send the occasional encrypted email or you need to send confidential email to a few clients. There are two free web based encryption services that I find very easy to use and are worth giving a try they are Infoencrypt and Sbwave Enkryptor . A-While composing an email message lick on the more option in the bottom right corner of a message and select request email receipt. Note may not always be present. Q- Can I recall a sent email? Q- Why should I use Google Drive Instead of just adding an attachment normally. A- Google drive is normally used when you need to send a very large message ( above 25MBytes ).